Mohamed Salah’s absence left Liverpool lacking attacking quality as Everton held them to a 0-0 draw in the Premier League on Saturday. 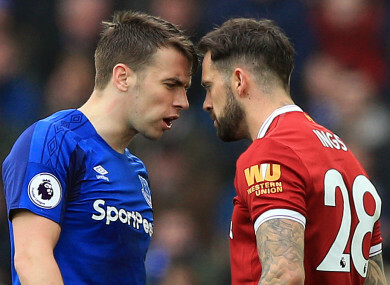 Ireland captain Seamus Coleman clashed with Danny Ings following a foul. LIVERPOOL MISSED THE striking prowess of Mohamed Salah as they passed up a chance to go second in the Premier League with a 0-0 draw against rivals Everton in the Merseyside derby. Salah, who has scored 38 goals in all competitions this season, was absent for Saturday’s clash at Goodison Park due to the groin injury he sustained in the 3-0 victory over Manchester City in the Champions League quarter-finals on Wednesday, and Liverpool’s second string failed to deliver. Dominic Solanke, starting down the middle with Roberto Firmino on the bench, was the main culprit as he wasted the two clearest chances of a drab encounter in front of England manager Gareth Southgate, while Loris Karius only had one Everton effort to deal with across the entire 90 minutes. The Toffees approach played a large part in reducing the spectacle and their performance will do little to stop criticism of Sam Allardyce from Everton fans. The home supporters would have left happy had Cenk Tosun, Seamus Coleman or Dominic Calvert-Lewin made the most of openings inside the final three minutes, but they had to settle for holding Liverpool to a draw that damages their quest to finish above Manchester United. Should Jose Mourinho’s side win their derby and stop Manchester City claiming the title later on Saturday, they will open up a four-point gap to Jurgen Klopp’s side and retain a game in hand. Without the attacking threat of Salah, Liverpool struggled to pose much danger in the final third as Sadio Mane, Solanke and Danny Ings – starting his first game in 916 days – all struggled to find room. Patience was key for the visitors and had Solanke done better on the rare occasions the Everton defence was unlocked they would have gone into the break ahead. James Milner’s cross from the left was headed wide by the 20-year-old, and when he was gifted a chance six yards out he fired straight at Jordan Pickford. Everton finally broke out of their defensive formation midway through the half when Yannick Bolasie cut inside from the left, but his curling effort was superbly pushed around the post by Karius. Liverpool resumed their dominance as Everton retreated back into their shell after the restart, much to the ire of the home faithful. Wayne Rooney’s game came to an end just before the hour as he was replaced by Idrissa Gueye, England’s record goalscorer snubbing Sam Allardyce as he left the pitch. The introduction of Alex Oxlade-Chamberlain and Firmino failed to spark Liverpool into life, but Everton finished the encounter well. A fine run from Leighton Baines brought a dangerous cross from the left but Tosun – so often bereft of service – failed to connect in the six-yard box. He wasted another golden opportunity in the closing minutes from Theo Walcott’s delivery, with Coleman agonisingly close to tapping in at the back post. Calvert-Lewin blasted off target one minute later as the spoils were shared, doing little for either side – although Liverpool will be delighted to avoid any injuries ahead of a massive game against City on Tuesday. Email “Everton rue late misses as Merseyside derby ends goalless at Goodison”. Feedback on “Everton rue late misses as Merseyside derby ends goalless at Goodison”.